Arpico Supercentre, one of the fastest growing supermarkets in the island has taken freshness to the next level, under the project ‘Sea to Plate’. This strategic initiative will allow customers to purchase the freshest catch at the most competitive prices without the involvement of middlemen. Currently, the catch of the early morning is distributed to the neighbouring outlets by mid-morning of the same day. What’s unique about this new venture is that Arpico has their own ‘day boats’ operating in the seas of Negombo and Beruwala. This guarantees that the catch reaches the customer within an accelerated time frame since the total value chain is managed by Arpico. This eliminates intermediary delays and added logistics costs from the shore to the Supercentres. This is the process that guarantees freshness and nutrition. This unique initiative by Dr. Sena Yaddehige, Group Chairman of Richard Pieris & Co PLC, is commendable since the convenience of the consumer has been considered. In a day and age when people’s lives are hectic and driven, this is a welcome respite since the freshness of the produce is unquestionable and you know that you receive value for money. The Richard Pieris Group continuously strives to exceed the expectations of clients. 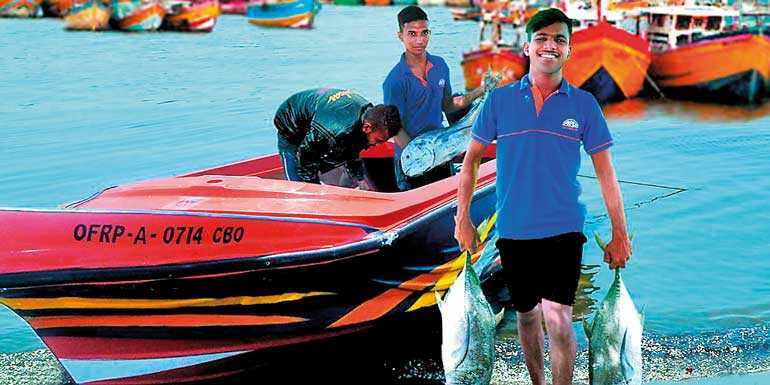 ‘Sea to plate’ achieves this by the innovation, and growth displayed through this initiative. They also uphold their tenet of striving to uplift the community whilst adhering to the highest ethical standards, with this new venture. Offering the widest range of products, the Arpico retail chain comprises of 25 Arpico Supercentres and Superstores, 12 showrooms and 23 Arpico Daily mini supermarkets. The Arpico Supercentres are the company’s flagship outlets, offering extensive parking, bill payments, banking facilities, lifestyle needs and the widest range of products with the promise to shoppers that they are the most convenient shopping destination in the country.